In the pursuit of progress, the past is often overlooked, neglected, discarded or forgotten. But to me, it holds an allure that is enticing, charming, mesmerizing and utterly seductive. Not so for everyone: When I first mentioned the abandoned village of Al Jazirah Al Hamra on the outskirts of Ras-al-Khaimah in the United Arab Emirates to my husband, he evinced his non-committal with a shrug of his shoulders. My computer eventually yielded a vague answer that left me dissatisfied and even more curious: a long-standing conflict between the ruling Al Qasimi family of Ras-al-Khaimah and the Za’ab family or tribe, led to most members of the Za’ab tribe leaving after the UAE became a confederation in 1971. The promise of wealth and a better life most probably played a role in their move to Abu Dhabi. Now, even more intrigued than before, I simply had to visit this place. Stories of powerful jinn (those hidden creatures of Arabic folklore and Islamic teachings) abound and while locals avoid the area, we decided to visit on a gloriously hot Saturday morning in late October. As we approached the village we were shocked at the very visible schism between old and new. The past is literally huddling in the shadows of a large new development ominously looming over it. Everywhere we looked, crumbling buildings are slowly disintegrating into piles of rubble that is revealing the building methods and materials that were used. The walls of coral and coral rag, a rubbly limestone that is made up of ancient coral reef material, as well as the exposed mangrove poles and palm tree trunks that were used for internal support and ceilings, create interesting patterns and textures in their exposed state. By leaving their properties behind to succumb to neglect and the ravages of time, the previous inhabitants of this eerie town left a unique glimpse into the past: a glimpse that offers a joyful abundance of photo opportunities. In the courtyard of one of the newer houses that has withstood the onslaught of time and vandalism remarkably well, palm trees, against all odds, still flourish. Their roots must have found the life-giving source that once fed all the covered wells that still dot the landscape. Elsewhere, splotches of red, blue and green paint stubbornly cling to wooden window frames and doors. As we ducked into a house with dominant wind towers, we found respite from the oppressive heat in its cool, dark interior. Here I closed my eyes to breathe in the past that clings to the dust. In a shady patch of sand we spotted the shy footprints of a desert fox, wishing out loud for a sighting, and as we looked up we noticed two men using a ladder to reach the upper branches of a tree. On closer inspection we realised they were busy tying a crudely made beehive to a branch in the hope of attracting a swarm of bees, and with it, the sweet, golden delight of honey. Remnants of human habitation in this area can be traced as far back as the 5th millennium BC, and maybe it was just my vivid imagination at work, but as I strolled through this almost desolate place, it was as if the division between the present and the past blurred just long enough for me to hear the faint whispers of stories that still linger in this harsh but magical landscape. Today, water tanks and satellite dishes speak of a new wave of human presence that is slowly breathing back life into a corner of the village. Here foreign workers live a precarious life on the edge of time. The prayer mats neatly rolled out amidst the crumbling walls of a once proud mosque speak not only of faith, but also of hope: hope that the sacrifices they make will ensure a better life for their families in faraway countries. Our last stop was at the fort and watch tower, the only buildings where one finds a fleeting glimpse of a hand that cares. 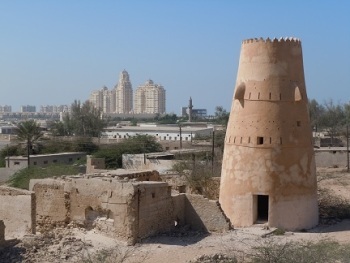 The Emiratis take pride in their forts and watch towers and are not shy to spend time and money to ensure that this part of their heritage stays intact. For an expansive view of the village we clambered up the ladder that leads to the roof of the watch tower. Not only did it give us a different perspective on the layout of the town, but also afforded us a view of the ocean and, for a brief moment, we could imagine what it must have been like when this turned into an island at high tide. Satiated with the sad beauty of neglect, but grateful for this brief moment of connection with the past, we left with more questions than answers.